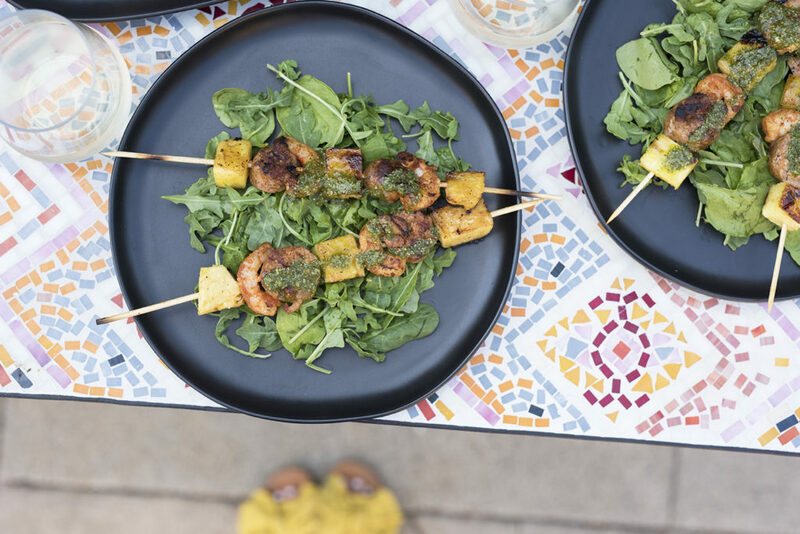 Pretty in Pistachio | Shrimp & Chorizo Skewer Recipe Paired with a Glass of Vinho Verde! 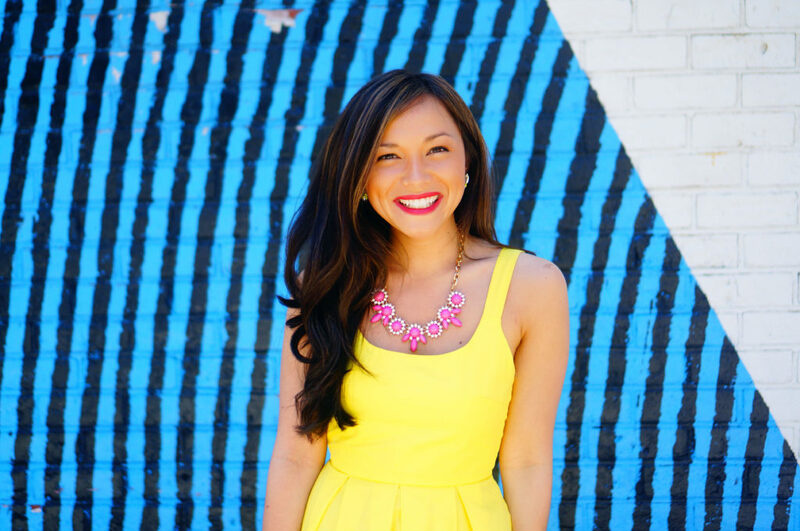 Since I don’t have any upcoming international trips planned at the moment, I wanted to create my own little cultural escape right at home! 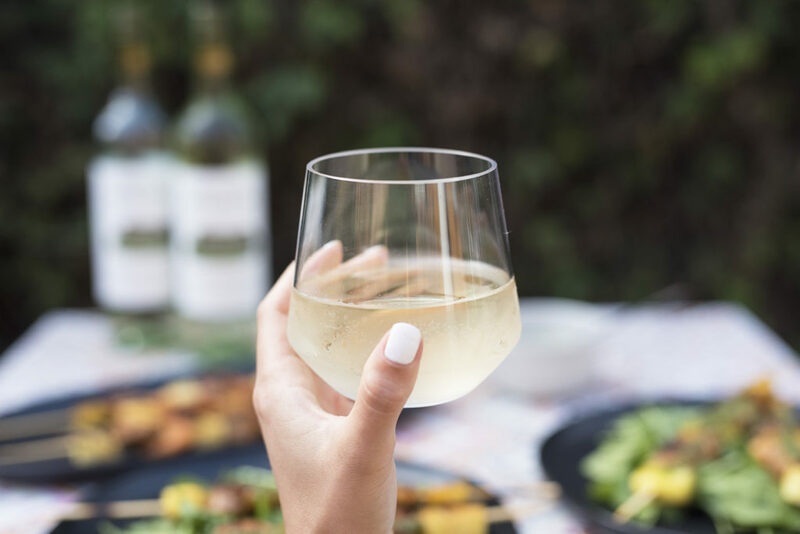 Today I’m diving into a white one from the Vinho Verde region of Portugal. 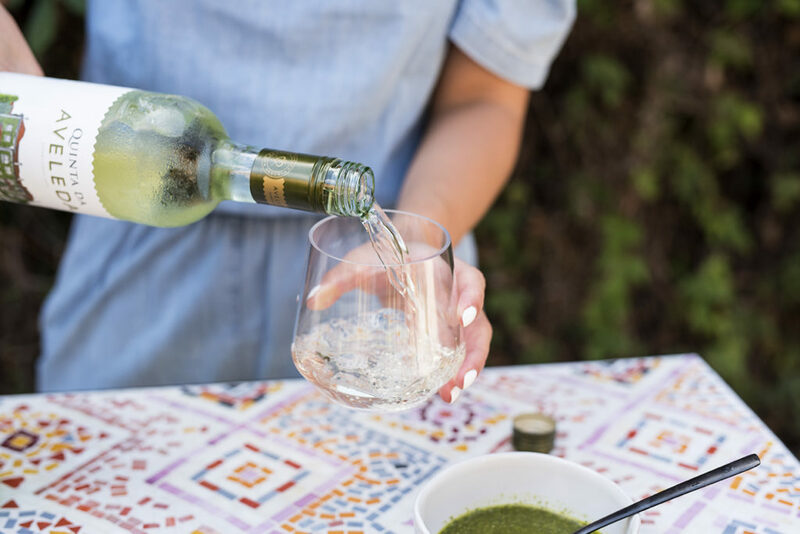 Vinho Verde wines are usually quite versatile and can be enjoyed year round. 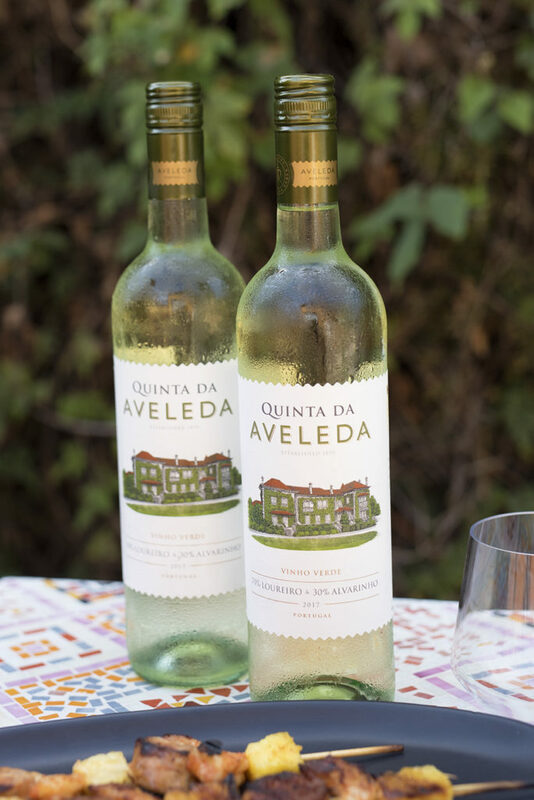 For this post, I’m going with a crisp and slightly floral white – the Quinta Da Aveleda. 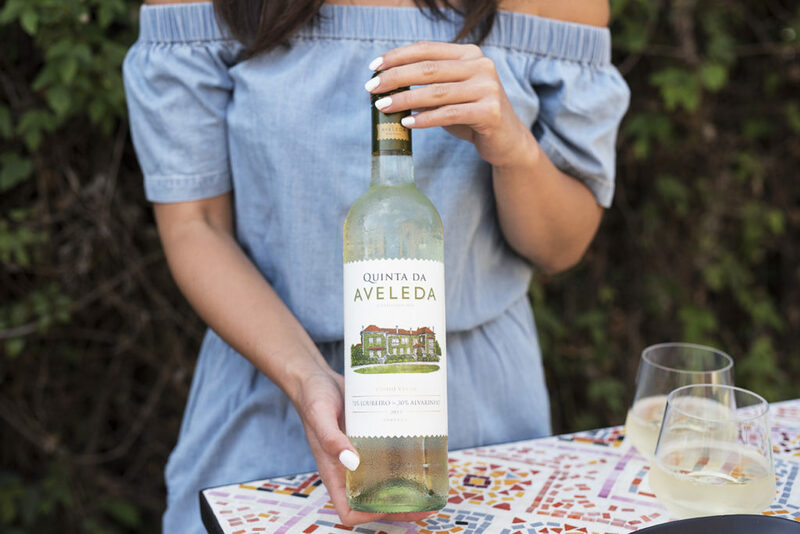 This wine is produced exclusively with grapes that come from the Aveleda Estate. The family at the estate has actually been producing wine there since 1870, now that is impressive! I like to enjoy this wine chilled especially during the warmer months. 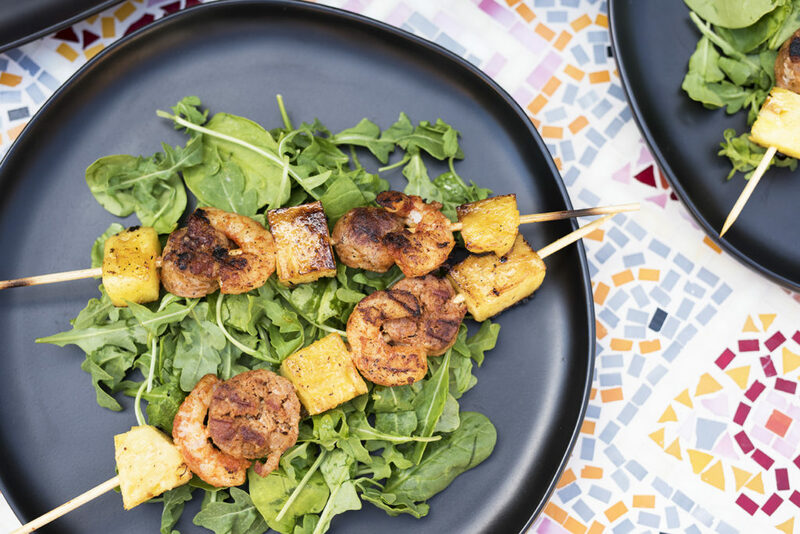 Here I paired it with a juicy chorizo and shrimp skewer. 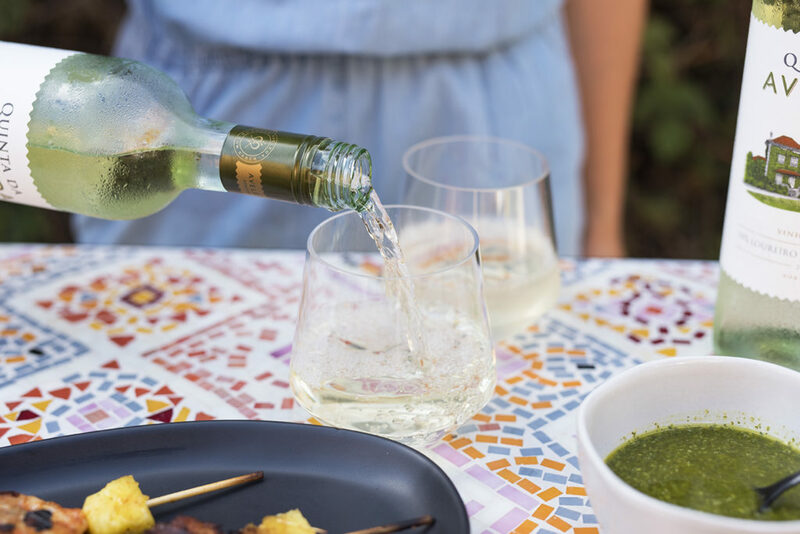 This wine works really well with seafood dishes, and like all wines from the Vinho Verde region, it’s super food friendly. 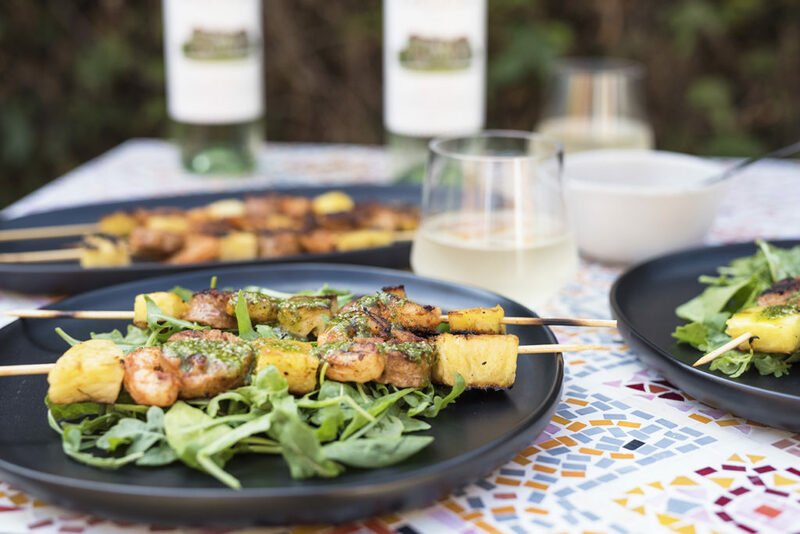 Chunks of pineapple were added to the skewers as the wine has a few tropical notes that I thought paired well with the sweetness of the pineapple. 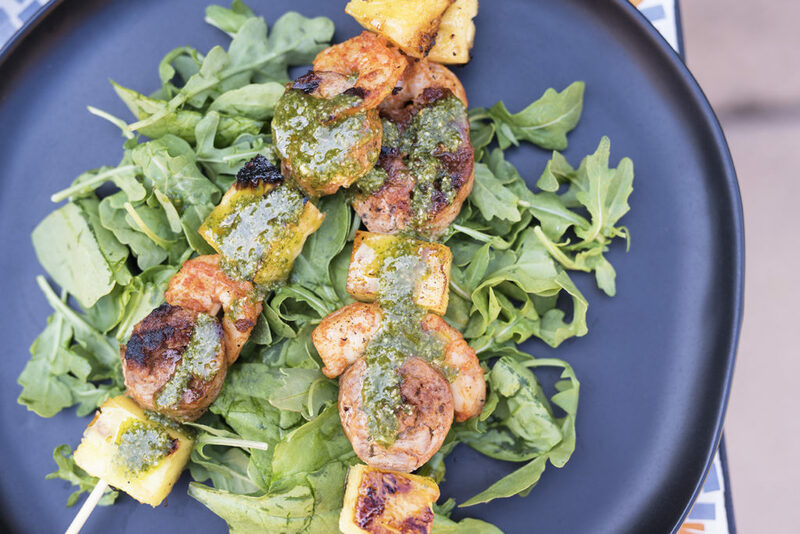 I topped the skewers with a fresh cilantro lime sauce and served them on a bed of greens. 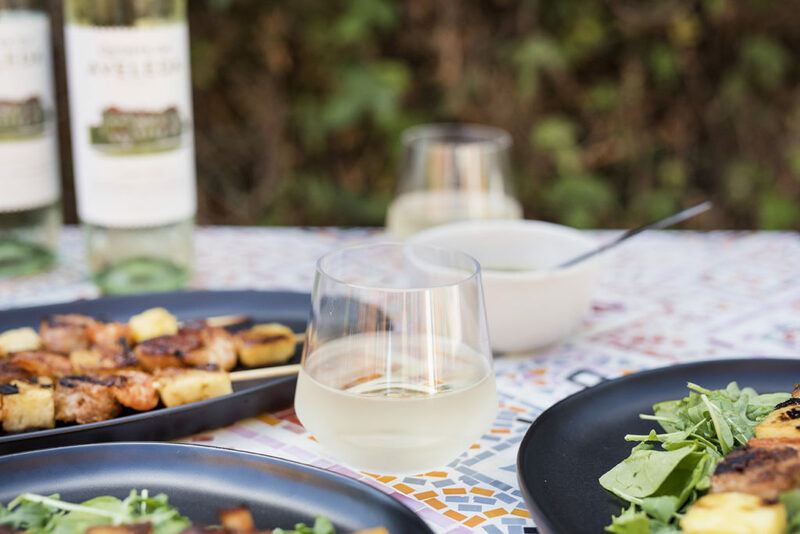 This would be a great meal to put together for a party or friendly get together or to even just enjoy at home as a dinner for 2! Wash and dry all produce. Add the cilantro, olive oil, garlic, and the juice of 2 limes to a food processor. Pulse until the cilantro is chopped into tiny pieces and all ingredients have combined to form a liquid like sauce. Bring a large saucepan filled with water to a boil over medium high heat. Add in the chorizo sausage links and boil for 7 minutes. Remove sausage and set aside until it is cool enough to handle. While the sausage is cooling, place the raw shrimp in a large bowl. Add the paprika, cayenne and cumin. Toss until all of the shrimps are coated. Once the sausage has cooled down, slice the links into 36 even rounds (each should be approx. ½” thick). 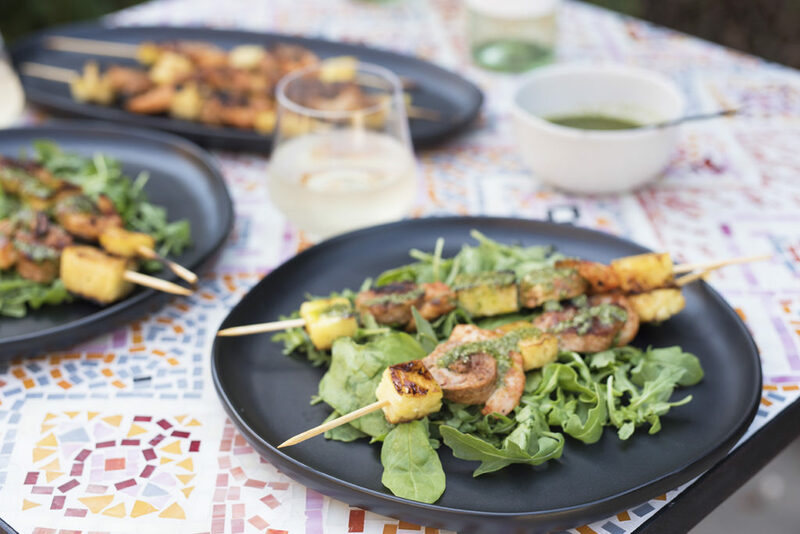 Assemble the skewers. 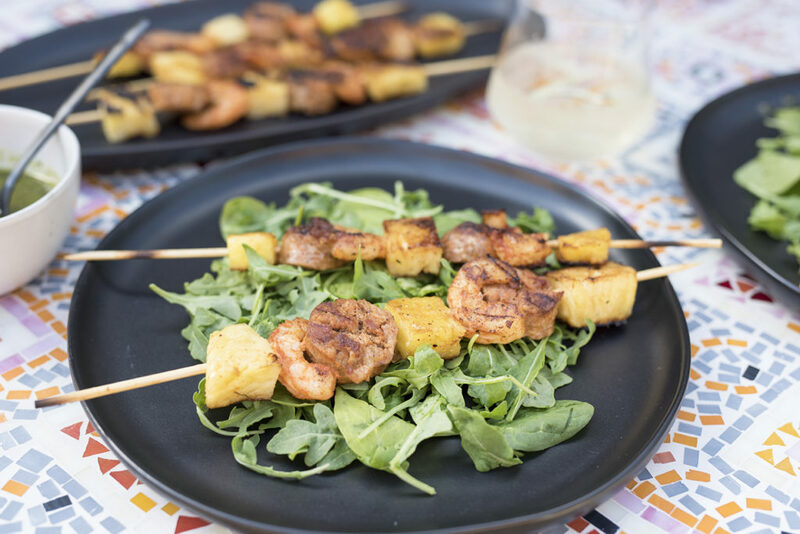 Take a skewer stick and thread it with one piece of pineapple followed by a shrimp then a chorizo round. Thread another pineapple, shrimp and chorizo round. Finish off with a pineapple piece. 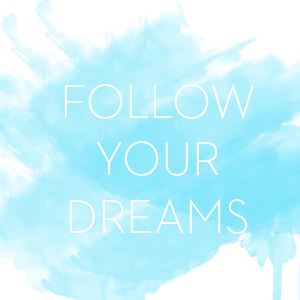 Repeat until all of your ingredients have been used up. Heat a grill or grill pan over medium high heat. If using a grill pan, brush on the vegetable oil. 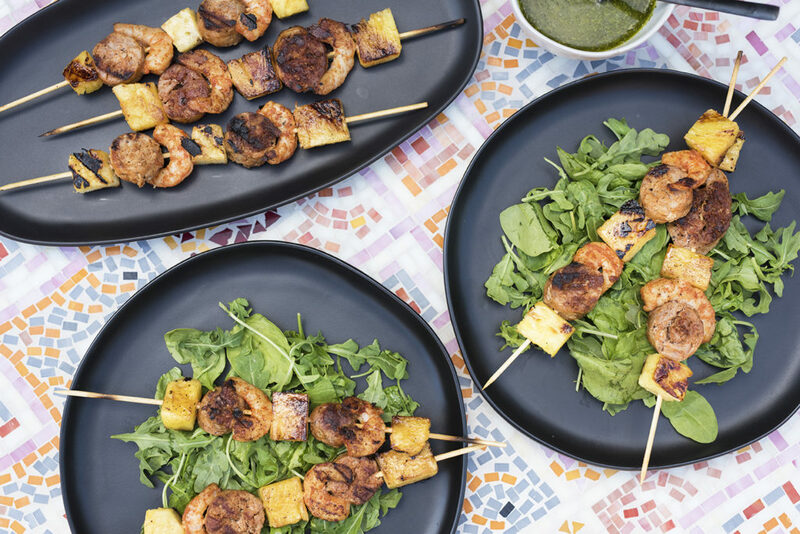 Place the skewers on top and cook approx.. 3-4 minutes per side. Remove from pan and set and set-aside until ready to serve. 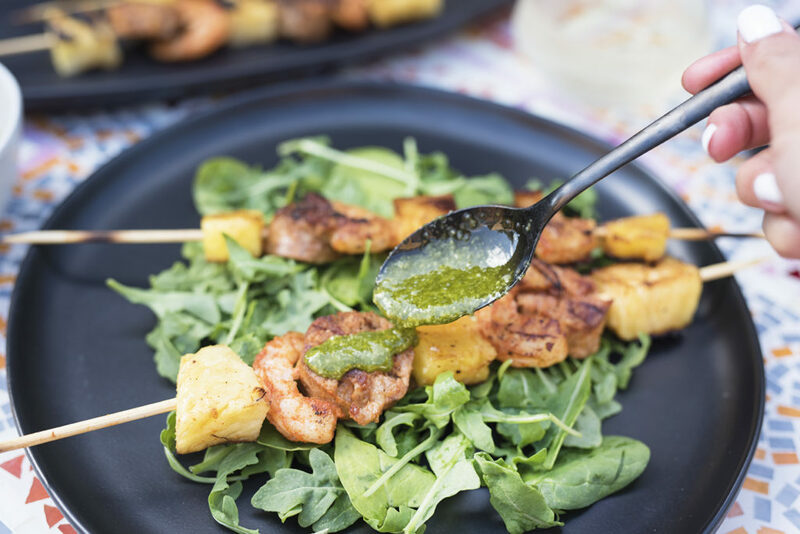 When serving, place a handful of salad greens on the plate, add skewers and top with cilantro lime sauce.